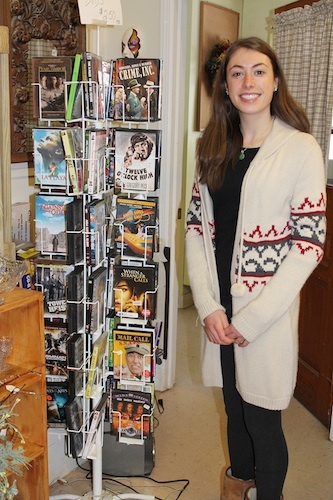 Claire Scott and the display of DVDs she helped collect for the Second Chance Shop. Claire Scott, a junior at West Morris Mendham High School in Mendham, NJ, who wants to major in business when she goes to college, has already shown that she has a flair for capitalism. Scott, who is active in her high school’s Future Business Leaders of America (FBLA) chapter, spearheaded a drive to collect DVDs that could then be sold at the Second Chance Shop, a thrift shop in Gladstone, NJ, run by The Friends of Matheny to raise funds for the students and patients at Matheny. Scott first heard about Matheny from a fellow Mendham resident, Kathleen Mangliado, who teaches in the Randolph Township Schools. Her DVD project was coordinated through Brenda DeRogatis, the teacher at West Morris Mendham responsible for FBLA. Since September, Scott has volunteered on Saturdays at the Second Chance Shop and will take a break at the end of February so that she can run track. She has enjoyed working at the shop and particularly likes it when some of the DVDs that she helped collect are sold. Although she has never been to Matheny, Scott hopes to bring members of the girls’ track team to visit this spring. The Friends of Matheny has raised more than $3 million for the students and patients at Matheny since the auxiliary group’s formation in 1983. The Second Chance Shop is located adjacent to the Gladstone United Methodist Church on Jackson Avenue in Gladstone. The shop is open Mondays from 9:30 a.m. to 6 p.m.; Tuesday thru Friday from 9:30 a.m. to 4 p.m; and Saturdays from 9:30 a.m. to 2:30 p.m. Donations of items in good condition are accepted on Mondays only. This entry was posted in Uncategorized and tagged Claire Scott, Friends of Matheny, Second Chance Shop, West Morris Mendham High School. Bookmark the permalink.